Today (14/7), on one of my very few `jollies` this year, out moth hunting and general natural history fun, I visited (in the company of Nigel Stringer) the home patch of our enthusiastic Llansteffan moth`ers, Mel Jones and Dai Stacey. It would have been nice to announce a `good find` in someone else`s backyard, but it was n`t to be; nevertheless it was a good day in great habitat. Above: at Black Scar, at the SW `corner` of the Llansteffan peninsula near Pentowyn farm. A trackway provides access and the saltmarsh habitat would be profitable to trap or to go `dusking`. The top photo shows the view across the Afon Taf towards Laugharne, whilst the lower photo looks back east towards the Craig Ddu cliffs. Ginst Point (MoD Pendine) is on the right-hand horizon, with Gower in the far distance. Sweeping and searching here and along the access lane yielded just over a dozen common species. 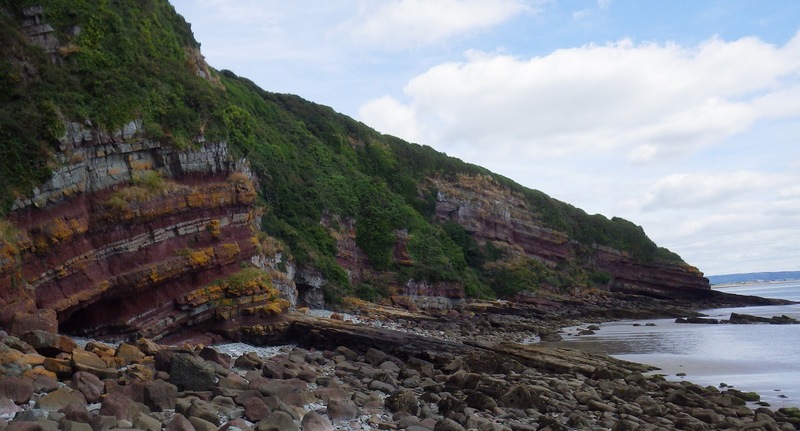 Above: later, we descended the cliffs SE of Laques-fawr via a narrow, wooded defile, aided by a rope tied to a tree. Golden samphire Inula crithmoides (in foreground), a rare plant in Carmarthenshire, is increasing here, with some 30+ plants noted. Nigel Stringer lurking in the background. In a seepage zone we noted much Phalaris and some leaves were mined. A moth, Elachista maculicerusella occurs on this grass, but so do do other insects, so I`m not sure if it is the afore-named species on this occasion (eg the pupa below looks rather rotund). I will try to `rear on` the two pupae collected. Above Phalaris leaf mine with pupa and close-up of pupa. I collected two pupae. Above: more scenic, `habitat shots`, I`m afraid - some of the Old Red Sandstone cliffs. Above: ...but I was disappointed to note that it was just a July highflyer! 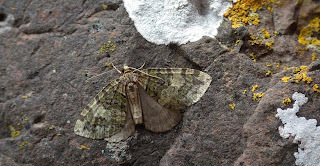 Above: finally, we stopped off at The Green, in front of Llansteffan itself and recorded a few common moth species. Looks a really great easy-access place to `dusk` or to trap! 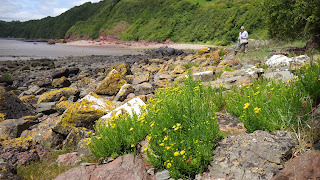 ...Perhaps I`ll discover Mel and Dai `trespassing` in the Pwll area one day? We`ll arrange something next time I`m down in the area!